Excluding forfeited games, Black won 11 games, White won 17 games, and there were 0 jigoes. Black won 19 games and White won 17. Seven players registered for the tournament. I therefore added GNU Go, running on a single processor of my own desktop PC. I believe that having this play is better than having byes. I believed that GNU Go was so weak that it would be unlikely to affect the result, but strong enough that it can win the occasional game. However, see below. I have nothing to say about the actual play, as most of the players are stronger than me. 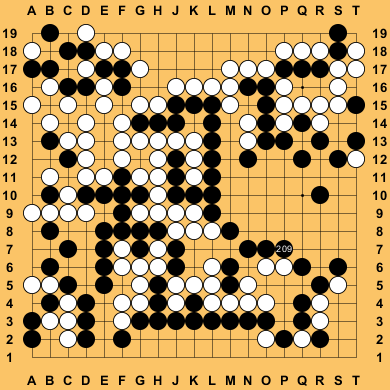 In round 4, gnugo3pt8 (rated at 6-kyu on KGS) beat nomiBot (rated at 2-dan). This surprised me. The game seemed unremarkable. In round 6, gnugo3pt8 beat NiceGo19N (rated at 1-kyu). This surprised me more. Again the game seemed unremarkable, with gnugo3pt8 making some poor moves, as I would expect from a 6-kyu player. NiceGo19N's operator admitted that it sometimes loses to version 3.9 of GNU Go when he is testing it. I wonder if the reason that nomiBot and NiceGo19N lost to a much weaker player, is that they are "trained" mostly against other Monte-Carlo bots, and have little experience of playing against old-style bots like GNU Go. But as the ratings of all three are derived from their games against human opponents, this is not a convincing explanation. It was one of the observers who tested oakfoam against gnugo 3.9, not me. Our actual download version is missing the large pattern database, so it is not comparable I think. We read the top left in the game not dead enough (90% dead). as it is a big area this lead to significant miscount. As we do not have dynamic komi oakfoam gave away a lot of points, as it had 80% winrate for most of the middle game. I think the probability of such problems is not so dependent on the opponent strength. If playing against even strong humans this happens from time to time and loosing does not harm the rating too much I think. By the way, I am training mainly against gnugo level 0 and gnugo level 10. But never with mc enabled. The diagram to the right shows position after Black played tenuki from the fight in the top left corner. It appears to me that the black group in the top left has no way to make a second eye, and that the game is very close. GNU Go version 3.8, running at its "level 16" on a single 3.3GHz Intel i5-2500 CPU. nomitan, running on 2 Xeon E5-2680 (total of 16 cores @ 2.70Ghz with hyperthreading). Orego, running one of the five nodes of a custom Linux cluster. The node has two AMD Six Core Dual Opteron 2427 2.2 GHz processors (12 cores total), 8 GB RAM, Centos Linux. Zen, running on a mini-cluster of a quad 16-core Opteron 6376@2.3 GHz, two dual 6-core Xeon X5680@4 GHz, a 6-core i7 3930K@4 GHz, a 6-core Xeon W3680@4 GHz, and a 6-core i7 980X@4 GHz computers connected via a GbE LAN. 6 computers, 106 cores total.